Reserve your Switzerland Untours vacation package now and look forward to hiking, mountain views, and breathtaking scenery. From the Alpine farming villages where you will make your home to mountain peaks and cosmopolitan cities, it's all yours in the Swiss Heartland. Stay in a chalet apartment with warm hospitality and good access to buses and trains. Day trip options: the towns of Meiringen, Bern, Thun, Brienz, Interlaken, Basel, Luzern, Zürich, Geneva, and Lausanne; the peaks of the Schilthorn, Jungfraujoch, Pilatus, Titlis, and more! Day trips and sightseeing: Between charming towns, museums with world-class collections, gorgeous lakes, snow-capped mountains, hiking and good wine and food, you will wish you had booked a several-months' trip. There is so much to do in Switzerland that we list just a few of the many possibilities: There are the cultured cities of Bern, Thun, Brienz, Interlaken, Basel, Luzern, Zürich, Geneva, Lausanne, Montreux, St. Gallen, Locarno and Lugano. 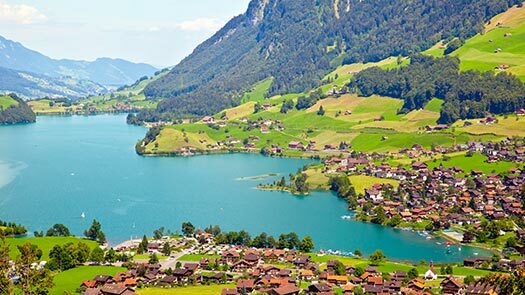 Switzerland has many lakes and rivers to visit: Lake Brienz, Lake Thun, Lake Luzern, Lake Geneva, Lake Zürich, Lake Zug, Lake Lugano, Lake Maggiore, Lake Biel, Lake Constance, the Aare River and the Rhine River. Alpine highs not to be missed: Schilthorn, Jungfraujoch, Schynige Platte, Pilatus, Titlis, Stanserhorn, Schönbüel, Brienzer Rothorn, Balmeregghorn, Planplatten. Switzerland has some of the finest museums on the Continent including the Kunstmuseum in Bern, the Sammlung Rosengart, the Picasso Museum and the Verkehrshaus (Transportation Museum) in Luzern, the Kunstmuseum in Zürich, the Fondation Beyeler in Basel, the Ballenberg Open-Air Museum near Brienz, the Hergiswil Glass Factory, and the Olympic Museum in Lausanne. Castles in Spiez, Thun, Oberhofen, Gruyères, and Chateau de Chillon are great trips and you can often combine them with a famous rail journeys: Golden Pass Panoramic Express, Glacier Express, Bernina Express. Off-the-beaten-track attractions that can’t be beat: Seeing and tasting Swiss cheese made on a family-operated farm in the Alps, listening to local musicians and yodlers at our farewell get-together, buying fresh bread at your local bakery, hearing a (free) symphony of cowbells as you stroll to your home-away-from-home after a dinner at a lakeside restaurant. buying fresh fruits, vegetables, flowers and cheese at the local open air market. Visiting the Sherlock Holmes Museum and tasting meringue in Meiringen. "The scenery, our hosts, the lakeboat rides; taking the bus from Meiringen to Schwartzwaldalp to Grosse Scheidegg to Grindelwald." Traveling in the next month or two? Check for discounts!